This is easily the best Clapton CD to get if your just getting into his modern stuff. This CD, along with 1994's The Cream Of Clapton, will give you a great oversight into his career! Blue Eyes Blue is a brilliant song, and in my opinion it is worth buying the CD just to hear it! There isn't a bad song on this album IMO, but buy Unplugged to get his the full force of that album! As a previous reviewer said, a must buy indeed! Acoustic, electric, drum machine, live, hits, new songs, ballads, it has this and much more take a journey with this album with EC and his taste of music. This is a CD chocked full of his more recent classics and needs to be in every EC fans collection. Blue eyes blue is one of his better acoustic songs of his career. It is on par with "Tears in Heaven" and "If I could change the World" Just that song alone makes the CD worth purchasing. I got lost is another song that appears on this CD that doesn't appear on any other EC albums. This album is such a inspiration to me. I am 17 years old and I love to sing as well as act. My favourite songs on the album are 'Blue Eyes Blue', 'Layla' and the touching 'My Father's Eyes'. As I am only 17 I did not know about Eric's life, but I'm so glad I do now. He has accomplished so much in such a short time, I hope he is proud of what he has accomplished because he should be, to me he is one of the most successful solo artists ever to be born. I would love to sing with Eric Clapton as I think he is so talented. Before I knew about his son Conor, I loved 'My Father's Eyes', but when I did have knowledge that the song was dedicated to his song it only made me love it more because the song shows how Eric was feeling at that time and it's such a beautiful song. I would like to say to Eric that he is such an inspiration to me and that he should never lose faith. This album I had bought nearly two years ago and still give me a good inspiration because I can say that all of his songs is so fabulous. For an example, "My Father's Eyes", "Wonderful Tonight", "Layla", "Forever Man" and many more. Finally I'd like to say to all fans of Eric, please do more support him no matter in singing or producing. Mr Clapton, sing more and hope you could success more on your career, Good Luck! This is a really good album this is a must buy I bought it while I was on holiday. I just couldn't resist it. We have played most of the songs in our band Relasys. Let me first say: The songs on this album are all great. Some of the songs are in better versions than on the original albums, but the majority are weak versions on my opinion. Take for example the version of Wonderful Tonight. This is not even the entire song. Also: If you own 24 Nights the songs from Journeyman and other classics seem extremely "flat" and boring, in these versions. It would be a great idea to create a "EC Greatest: Live" Because his music is best in live concerts. 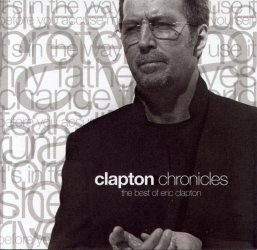 This album, The Best of Eric Clapton, is truly an excellent for a younger audience because it gives a great overview of his life works. From the 80s to the 00 we hear the transitions in different genres of music and how Eric deals with his life problems. especially in "Tears in Heaven". For a new audience this album contracts Eric's accomplishments and all that he endures into one great album. This album would satisfy any music lover and thrill any EC fan....a must buy album. This is the best album for new fans in order to have a good taste about EC's music. For us, it is a review about EC's evolution through blues.